IS ISRAELI PROME MINISTER SHARON USING THE FORCED SETTLE EVACUATION AS AN EXCUSE TO CRACK DOWN ON ORTHODOX, OBSERVENT JEWS? Title: IS ISRAELI PRIME MINISTER SHARON USING THE FORCED SETTLER EVACUATION AS AN EXCUSE TO CRACK DOWN ON ORTHODOX, OBSERVANT JEWS? Subtitle: Devoutly religious Jews are the designated enemy of the Illuminati, as I learned directly in 1995. Sharon suddenly seems to be attacking these religious groups without provocation and without evidence. Is a confrontation between Israeli authorities and these devout Jews on the horizon? Please carefully notice this Illuminati Card to the left (Read NEWS1753 for explanation of this card game). The title clearly reads "Death To All Fanatics". The type of fanatic designated for death is not specified on this card; therefore, one is left with the correct impression that the Illuminati plans to eliminate all fanatics, of all types and religious persuasions. Indeed, this is most definitely the case. I learned very early in my study of the global plan to produce Antichrist that the Illuminati does hate all extremists and plans to physically annihilate them. Whether these religious fanatics are from the Muslim religion, or Christianity, or Judaism, the ruling elite hates them all. But, most interestingly, the Plan calls for certain groups considered fanatical -- especially Christians -- to be attacked, not only by paid police and paramilitary men, but also by "little old grandmother" types who have been convinced by incessant propaganda that Christian fanatics are evil, dangerous, and need to be killed. 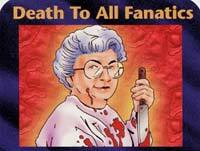 Thus, this picture shows an innocent-looking grandmother wielding a meat cleaver covered with blood. Today's Mass Media propaganda is so effective, it will convince even some of the grandmothers of America to take up the cleaver against all "Christian fanatics". On August 18, 1991, I was sneaked into a House of Theosophy "Member's Only" seminar by a member who had been Born Again but who had not formally notified the Boston headquarters that he was resigning -- which he did soon after this seminar. (Read my notes and comments on this seminar in NEWS1052). During this seminar, I was shocked to hear the New England Director state, very matter-of-factly, the intense dislike for Orthodox Jews. Further, this statement was spoken in such a manner as to give the impression that one of the goals of the entire "New Jerusalem Covenant Project" was to permanently erase the power and influence of the Orthodox Jews. "... any purely political settlement in the Middle East would not, by itself, bring peace. In other words, a purely political settlement would leave the religious nature of the problem unsolved. 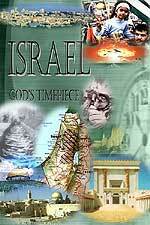 Any permanent solution to the Middle East conflict would also have to see the religious portion of the problem solved. Once this religious problem is solved, then the power and influence of the Orthodox Jews in Israel would permanently decline." Notice that this paragraph contains four (4) sentences. Three of the sentences contain a reference to the "religious" problem; the final solution most definitely includes a provision to send the "power and influence of the Orthodox Jews in Israel" into permanent decline. Why does the Illuminati hate the Orthodox Jews so completely? As I see it, there are several reasons for this loathing. 1) As we stated above, all groups fanatical in their religion are hated and all are targeted for extinction. Religious fanaticism is viewed by the Illuminati as being unique to Monotheistic religions (Islam, Christianity, Judaism); polytheistic religions are "tolerant" of other religions and so fit in better with the polytheistic Witchcraft religion of Antichrist. At least, this is the belief of the Illuminati. 2) From the beginning of the secular state of Israel, Orthodox Jews have been the thorn in the side of secular Israeli leadership. 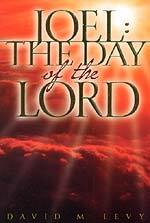 Their insistence upon strict observance of Old Testament laws and regulations have always angered and irritated top leadership. 3) Most Liberal Jews hate the distinctive dress and mannerisms of the Orthodox Jew. The owner of one of my companies when I was active in Retail Management one day shocked me when he described meeting a group of Orthodox Jews in the subway on the way to work in downtown Manhattan. As he expressed his unbelievable antipathy towards these people, I wondered if Adolf Hitler could have hated them with any greater intensity. This modern, successful, and very rich Liberal American Jew really hated this particular group of his own people. 4) When Antichrist arises, the Orthodox Jews will be leading the charge to insist that Israel not accept him immediately as the Messiah for whom they have long been awaiting, but to wait to see if he systematically "fulfills" all Old Testament Messianic prophecies and Talmudic expectations. 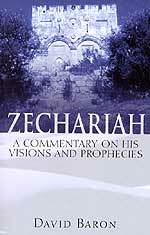 In other words, Orthodox Jews will hold up the entire process of Messiah "confirming the covenant" with Israeli leaders, an act which the Bible says is the beginning of the Tribulation Period (Daniel 9:27) and which the Illuminati considers to be the first 7-year segment of their Christ's 1,000-year reign (Peter Lemesurier, "The Armageddon Script"). When the citizenry blindly follows its leadership and accords its officials almost god-like status, then an official can step to the microphone to inform Cabinet officials of a "serious threat", even though he presents little to no evidence. We see this sad situation in America, do we not, when Tom Ridge of Homeland Security and/or John Ashcroft of the FBI stands repeatedly at the microphone, warning of dire, immediate threats to our national security -- but will admit when pressed that they have little to no intelligence upon which to base the false threat declaration. MORE SERIOUS CHARGES - JEWISH EXTREMISTS ARE PLANNING TO BLOW THE DOME OF THE ROCK! However, Arafat might be the one who actually carries out the deed. In NEWS1429, we note that a young Arafat was blackmailed by the Russian KGB to become the leader of Palestinian Liberation Organization (PLO) in 1968, threatening to reveal his flaming homosexuality. This revelation means that Arafat was controlled by the Illuminati, even more tightly than Israel is controlled by the Western Illuminati.